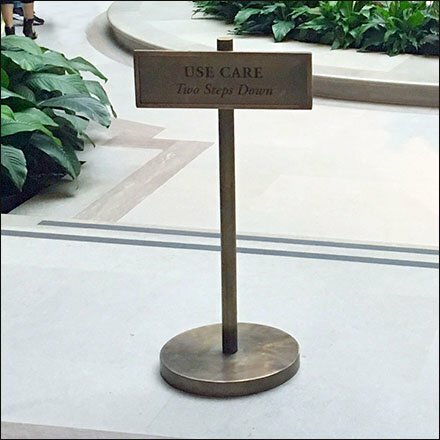 Only the National Academy of Arts would be so reserved and genteel with its Use Care Step Down Warning. I don’t know if effective but the warning is necessary as patrons eyes are everywhere else but down, looking where they are going. While the lower plaza is an architectural delight the shallow, almost invisible steps down are a danger to life and limb. This Use Care Step Down Warning seen, where else, but the National Academy of Arts, Washington DC. Inspect from various distances in the gallery of images.